Always encouraged to play any instrument by my parents, I did a lot of multi-track recording as a teenager, but spent my young adult years as a hobbyist, until I moved to Austin in my early 30’s and formed my first band. The song’s about the fantasy world my mother created for herself. She was timid of actualizing herself in life, either because she was too scared or it was “too much work”, and she became a suburban wife and mother instead of the independent spirit that she actually was. To console herself, she created her own world out of bits and pieces of her Germanic heritage, and I spent a good deal of my childhood chasing down knick-knacks with her in curiosity shops and antique malls, gathering props to set the stage for her fantasy. She was also big on musicals, and was fairly driven to have life play out like a musical instead of the messy, complicated thing it actually is. So at least I was able to immortalize her as a character in a song. there can literally be hundreds of bands playing in every single genre on any given night of the week. People are used to four or five bands being on the roster of any bar or club they might go to. Here, it’s not about finding live music, it’s about narrowing down an overwhelming number of choices. And for musicians, it means relative ease in finding any type of group to play with on any instrument. Many musicians play in several bands. And the expected quality of a player or a group is significantly higher than we have experienced when playing in other cities. I think I started playing music professionally at a very good time. WinoVino has always been able to record and distribute its own music, promote itself online and book shows relatively easily. In another era, recording would’ve been prohibitively expensive, and waiting around for or vying for a label to notice us wouldn’t have allowed us to get as far as we have as quickly. It’s also easier today, I think, to choose your level of involvement. For me, music is a nice secondary income, and I’m happy with that. It would’ve been impossible not so long ago to communicate with as many people so rapidly. I also like that it allows you to convey a casual thought or sentiment; I can just throw out a random comment to a friend hundreds of miles away instead of having to sit down and write a letter about every thing that’s happened in my life for the past six months. I don’t know if it’s a challenge, but I’m 45 and still hard-wired to the way we communicated in the 20th century. I just have no desire to be constantly checking in with my device or letting the world know every insignificant thing I’m up to every moment of the day. Why, I still write things down on paper! for releasing new material is more shingles-based and it’s working out better for us. Due to time or money constraints, we go much longer between releasing full albums than our fans like. This time around, we decided to record 3 or 4 EPs with all our new material. It only takes a few days to record an EP, we can have one ready for distribution much faster, and we sell it for $5 at a show which is much easier to get an impulse purchase on. Over the next year, when we’ve released all the EPs individually, we’ll then compile them into a full album which people can purchase that way if they wish. watered-down coffee with Brian Eno in the food court of a premium outlet mall so that we could talk about what kind of ambient music would be most effective for lulling the shoppers into a sense of security while acquiring their material affirmations of what is ultimately a random and unknowable chaotic world. it was absolutely not following any current trends. There was a brief window in 2009 with all the steampunk hullaballoo when suddenly we looked and sounded “appropriate”, but then it passed on by again. During the part of my life when I lived in San Francisco, I’d see people adopt and dump entirely new personas based on what was popular that year. People who adhere religiously to trends disturb me, and their music always lacks any stamp of lasting distinction because of it. Not too long ago, we shared a bill with a band from New Orleans because our band arrangements and musical styles were similar. But they were totally looking and playing the part, and I think that they were kind of horrified that we could get up there in our jeans and t-shirts and play as well or better than them, and then jump to a type of song totally outside the realm of our “brand”. I can’t drive on them at all. I have to find alternative routes around them wherever I go, because I either feel like my soul is leaving my body our that my car will go careening over the side and I’ll die in a fiery inferno. is that I am authentic. I’m not hiding parts of myself or keeping myself from doing things that I’d like to. For much of my life I, too, was like the character in the song “Liechtenstein”: dreaming life away as a music hobbyist and working unsatisfying jobs in which I’d always become resentful, thinking I “deserved” more, but never taking the steps I needed to get it. It’s not about money. It’s not about status. It’s about being who you really are. Tying in with my definition of success, I’ve recently gone from working a string of day jobs in which I eventually become burnt out on and resentful of to starting a career in massage therapy: taking the holistic wellness I’ve always practiced with myself and using it to help other people. I do just enough of that, and play just enough music to fell successful and engaged, but not so much that it sours on me or loses its appeal. 1) For the past several years, I’ve been learning how to play a new instrument about once a year. It keeps your ears open and your musical approaches fresh to have to work with an unfamiliar instrument in a new way. 2) Making a commitment to flesh out all my random ideas. Since I have a recording studio on my laptop, I try to turn as many of my ideas into actual songs instead of just letting them fade inside my head. 3) Since a great deal of my early life was spent sabotaging myself with fear, I try to commit myself to being fearless getting in front of any sized audience and feeling comfortable and at home, try to be honest to myself in discussions with my bandmates, and see how honest I can be to myself doing new things like live radio interviews. 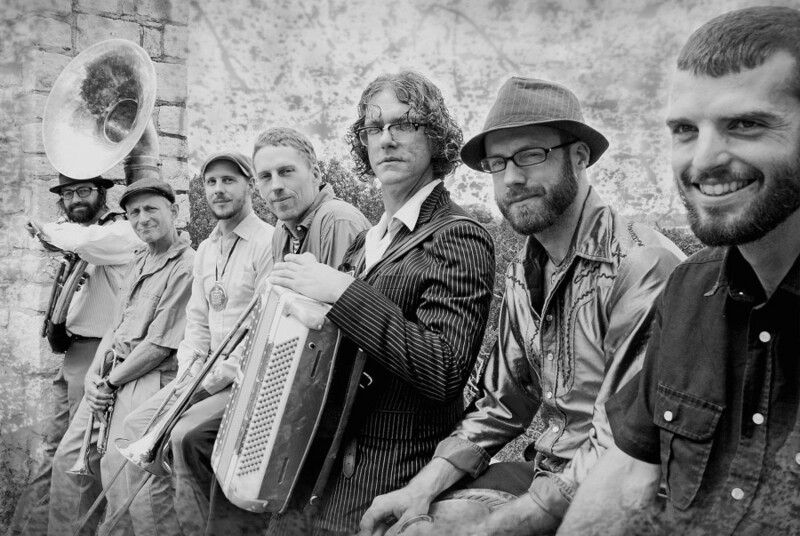 Winovino is Austin’s very own Eastern European folk-influenced troupe of circus-minded rabble-rousers. Their music is like a huge party, and it doesn’t matter your age or where you’re from as long as you can dance like it’s your final days. The six or so piece band will throw a lot of looks, and a lot of sound at audiences. Winovino brings to bear accordion, stringed instruments, and horns to touch upon many different styles and genres of music including Cabaret, Swing and Balkan brass.